Lake Las Vegas is just 20 minutes from the Las Vegas Strip, but it feels a world away. Lake Las Vegas is a master-planned resort community offering all the amenities and resources you need, including restaurants, stores, two golf courses, nearby trails, and more. Lake Las Vegas provides endless opportunity for water activities like kayaking, paddle boarding, and boating. With more than 10 miles of shoreline, the 320-acre Lake Las Vegas provides the much-needed respite from the dry desert heat. There are two award-winning Jack Nicklaus designed golf courses within arm's reach of Lake Las Vegas. Reflection Bay Golf Club is located on the North Shore. Gaining recognition from Golf Magazine and Golf Digest, this prestigious course opened its doors in 1998 and has been host to several PGA events. Reflection Bay Golf Club features a 32,000-square-foot clubhouse with casual and fine dining options, a golf shop, and even a private white sand beach. SouthShore Country Club is the first private golf course designed by Nicklaus in the state of Nevada. The 6,925-yard championship course is par-71 featuring generous fairways, strategic bunkering, and water and canyon features. Learn more about our area golf courses. Las Vegas is known for its world-class gaming facilities, and there are plenty close by without having to go to the Strip. 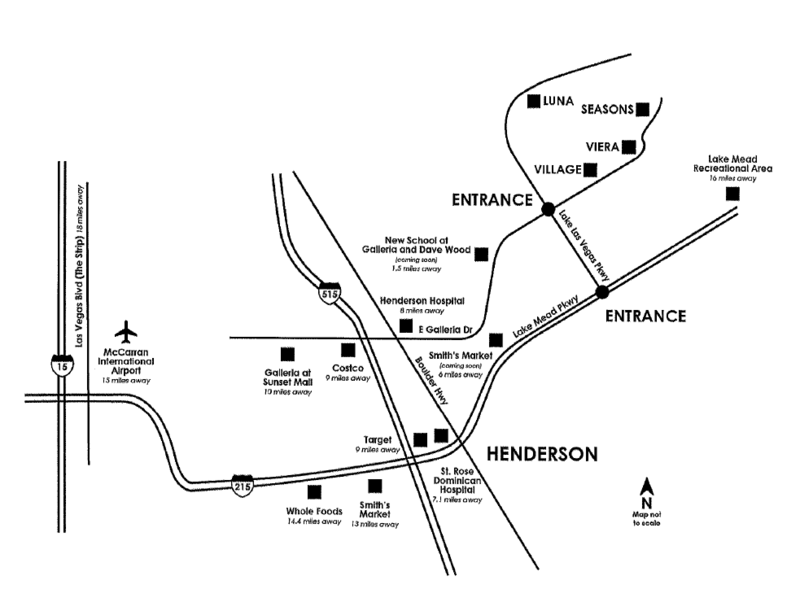 Fiesta, Sunset Station, and Green Valley Ranch Casino are within 15 minutes of the Lake Las Vegas Resort. Being outdoors is a way of life around Lake Las Vegas. There are dozens of miles of trails in the area, including the at Lake Mead National Recreation Area, Red Rock Canyon National Conservatory, River Mountains, and more. But it's not even necessary to leave Lake Las Vegas to be active. Try stand up paddleboard yoga, rowing, kayaking, or even dragonboat racing right on the Lake. Las Vegas Ski and Snowboard Resort is located at Mount Charleston in Lee Canyon, about an hour from Lake Las Vegas. The resort features ski and snowboarding runs, as well as tubing and sledding in the winter. During the summer the resort stays open for hiking, disc golf, and more. Need a day of complete pampering? Spa Ravella, G Aveda Spa Lago, Spa Moulay, and Spa and the LINQ are all within the immediate Lake Las Vegas Area. Treat yourself to a massage, nail services, or a new haircut. Buy a new piece of art at The Galleries, pick up groceries at Seasons, or stock up on chocolates at Rocky Mountain Chocolate Factory. In addition to the shopping at Lake Las Vegas, The District at Green Valley Ranch and the Galleria Mall are both a 10-minute drive away. While there are spots to pick up food to cook in your vacation rental, dining options in the Village at Lake Las Vegas are plentiful. Enjoy Mediterranean cuisine at Luna Rossa Ristorante, upscale American at Proof Tavern, or seafood at Sonrisa Grill. Gelato at Bellalinda Gelateria Italiana is a must-visit on hot days. Lake Las Vegas resort rentals offer the space and convenience of home while on vacation. There's so much to do and see in the Lake Las Vegas area, and we'd love to help you plan your perfect trip.